Copper is an inviting metal that marries elegant shine with a rich, warm tone. When used with furniture, lighting, and home accessories, copper elevates the look of the item, while still maintaining its accessibility. 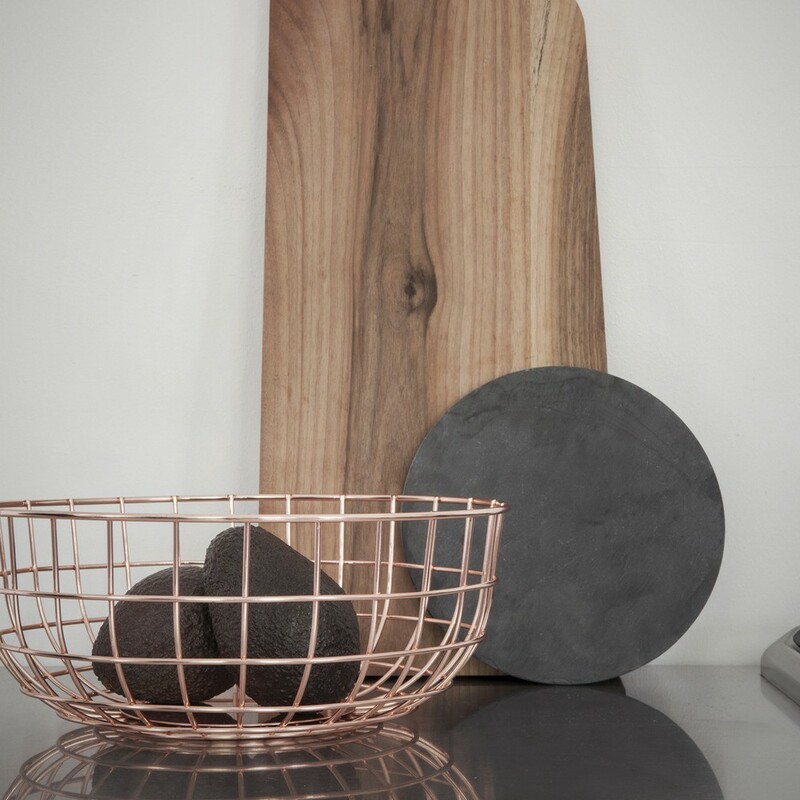 This assortment of copper products has something for every design seeker looking to add metals into their modern home. With its Wire Bowl, Menu takes a simple storage accessory and recasts it as a distinctive accent. Comprised of steel wire, this wire bowl has been copper plated for a warm, elegant look. The wire bowl can be used for a variety of functions, from holding fruit, displaying accents, or for storing textiles like napkins or dishcloths. It is also available in other metals and powder-coated colors. The Frame Pendant Light from Iacoli & McAllister is a simple light that celebrates the source of illumination—a simple white light bulb. The bulb is encased in a steel frame that has been plated in copper, creating a shiny finish on the geometric pendant light. It can be used on its own, or grouped with other Frame Pendants (as pictured) to create a graphic display. Designed by furniture designer Brad Ascalon for Juniper, the Peasant Side Table is made almost entirely from off-the-shelf stock materials. Ascalon and Juniper wanted to create a table that had lower development costs, while still focused on high-quality materials. The table has a copper frame creating a small footprint, making it an ideal side table for confined living rooms and large great rooms alike. From Yield Design Co., the Solid Copper Cup is an elegant drinking vessel that features a simple cylindrical shape that makes it stackable and versatile. The choice of material for the cup is not only an aesthetic one, but also practical. Copper is a naturally insulating and antimicrobial material that makes it functional for a variety of liquids and occasions. The Algedi Marble Side Table from Iacoli & McAllister is a versatile furnishing that carefully balances materials to create a striking accent. Comprised of a Carrara Marble tabletop that is fixed atop a copper-plated steel base, the Algedi can be used in a variety of interior spaces, from living rooms and offices to bedrooms and guest rooms. With its industrial aesthetic cast iron base, minimal metallic shade and classical proportions, the Base Lamp from Tom Dixon remains an interior design staple. Traditional matte textured cast iron makes up the robust body, supporting a spun-copper shade that has been highly polished to create a super-reflective and alluring shine. The Lift is both a functional serving piece and an attractive decorative accent. Handcrafted in brushed brass and finished in brushed copper, the Lift includes a circular tray and three balanced supporting legs. The middle of the tray features a simple open circle, adding a sense of cohesion to the piece. The Lift was designed by Felicia Ferrone and is available in two sizes. The aptly named Chunk Candleholder from Menu is a solid, substantial piece that looks purposeful and strong when set on a shelf or table. The cylindrical marble slab features a copper top, which counters the organic, raw nature of the marble with sophisticated shine. The result is a well-balanced accent that is an attractive decorative element whether it is holding a candle or resting on its own. It is also available in a smaller size.